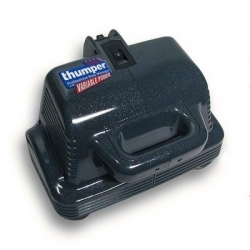 The Thumper Maxi Pro is ideal for clinical use by Chiropractors, Massage Therapists and Athletic Trainers. A full body thumper massage takes around 5 minutes leaving the patient completely relaxed. Its 8 anatomically designed massage spheres use tapotement to effectively work the muscle tissue. The unit penetrates a full 6mm into the tissue between 18 and 32 times a second (depending on the speed selected). The Maxi Pro weighs 3.2kg which provides all the necessary force to provide a sensational massage.